Our Staff is second to none in the State of Alabama for the number of players that have been developed into Champions. ACE is the only Junior Development Program in the state to have Champions in the following events: Men's & Women's USTA Pro Circuits, Men's & Women's NCAA team and Individual Champions (Ga Tech & UVA), ITF Junior Circuit, National Regionals & National Opens, Southern Closed & Southern Opens. We have had over 75 former players who went on to play college tennis and several that have made it to the Pro Tour. Several ACE players have received the BG12s Southern Closed Sportsmanship Award and one of our players received the prestigious DeWitt Redgrave III Male Junior Achievement Award for the Southern Section. Our staff has over 100 years of coaching experience and success in the tennis industry, with the hardware to prove it! Jack started teaching tennis in Jacksonville, FL in 1987 as a Staff Pro for Diverse Tennis Services. Since that time, the game has taken him far and wide. He served as a Director of Tennis in Alabama, Georgia, Florida and Texas. He moved to Birmingham permanently in the summer of 2000 to become a partner of "The Academy" at the Lakeshore Foundation. Since then he married a great lady, has 3 beautiful daughters and been a major influence in the lives and development of some of this nation's best junior players. Flip has been involved in the game of tennis since 1976. He was one of the founding partners of "The Academy" at the Lakeshore Foundation in 1996. He has served as a Director of Tennis at Birmingham Country Club, Maryland Farms Racquet Club - Brentwood, TN, Wimbleton Racquet Club - Memphis, TN, as well as being on the staff at Nick Bollettari Tennis Academy in Bradenton, FL. He enjoys teaching men's and women's teams, but his passion is junior development. He has coached numerous players that have won Sectional and National tournaments. Many of these players went on to play college and professional tennis. Flip was recently honored as the USPTA "Pro of the Year" for the State of Alabama for 2007. Jenny Robb is the Director of Marketing & Communications and the Junior Team Tennis State Coordinator for USTA Alabama. Jenny grew up playing a variety of youth sports in Vestavia Hills, Alabama before played NCAA Division I tennis at Samford University in Birmingham, AL where she earned her Bachelor of Arts in English/Language Arts. During her college years she coached summer camps at Hampton Racquet Club in East Hampton, NY and internationally in Canazei, Italy. Over the last 17 years Jenny has coached in a variety of training environments including: Country Clubs, Park and Recreation facilities, Tennis Academies, and Fitness Centers. She has coached adults and juniors at the State, Sectional, and National level and helped numerous young athletes achieve college tennis scholarships. She is currently the 10 & Under Director for Alabama’s Court Elite. Jenny Robb is driven by a passion for learning and sharing, with goals of growing the game, developing tennis athletes, and raising the standards of tennis teaching professionals. 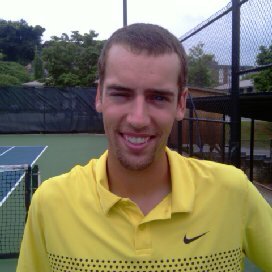 After a successful playing career at Marquette Universtiy, Trent began his career as a tennis professional in 2009. He has served as the Head tennis professional at ACE, the Country Club of Birmingham, and most recently at the Head Professional at Alabama's Court Elite. Trent has nearly ten years of experience providing training and instruction to adults and children, including periodic fitness and strength training, and coordination of tennis tournaments and events.